If you’ve come across beeswax in recipes, you may have seen measurements in tablespoons, cups, ounces, grams, or something else. How do you know how much beeswax that really is when you’re purchasing, especially when a recipe has volume and beeswax is sold by the weight? In this short post, I will share some simple conversions to make purchasing beeswax for your recipe a little bit easier. To get exact amounts for your recipe, check out this calculator, which is perfect for converting volume to weight! Good luck with your next recipe! I’m not certain when I first learned about the traditional Japanese wrapping cloth, but I have made much use of the versatility of furoshiki. Today, I’m going to share one way of using a square piece of fabric to wrap a simple gift – two jars of honey! Lay the fabric flat with one of the points close to you. 2. Place your jars beside each other near the corner of the fabric closest to you. 3. Tip the jars on the side leaving the footprint of where they were standing open. 4. Fold the corner of the cloth over the jars. 5. Roll the jars and fabric carefully until you reach the end of the fabric. Try not to move the jars closer or further away from each other. 6. Tip the jars back upright. 7. Tie the long ends of the fabric in a square knot as close to the tops of the jars as possible. 8. To create an carrying handle, tie another square knot with the ends of the fabric you just tied. That’s it! Your package is ready for gifting. 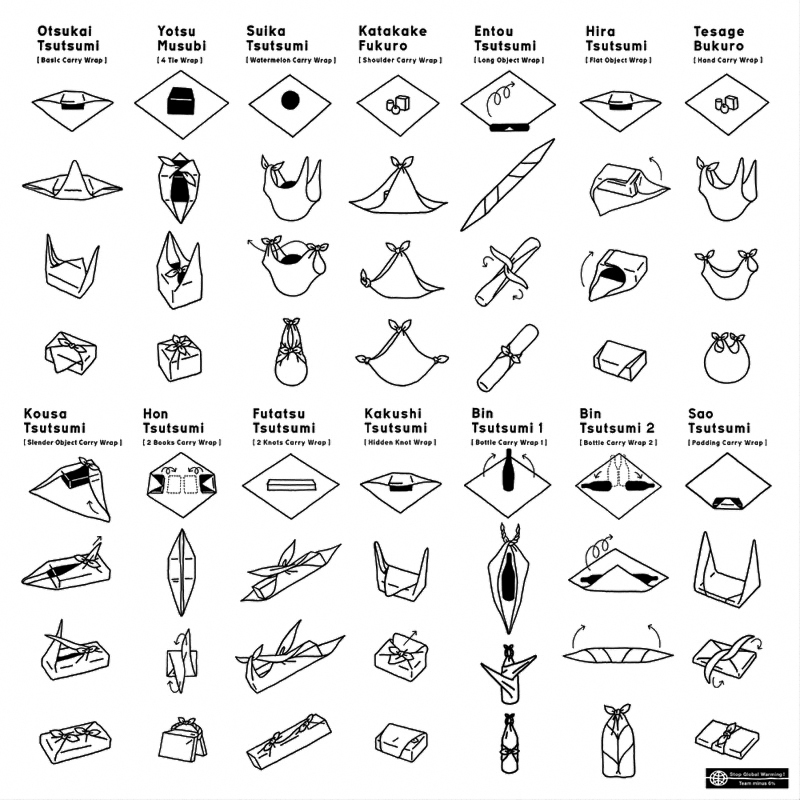 This is not the only way you can wrap a gift using furoshiki. Check out this handy chart if you have a gift of a different shape or size. Have you ever wondered what bees do? We’ve put together a sneak peek into our hives throughout the year! As the season starts to change, it’s time to take an initial look at the hives to see how they fared over the winter. Sometimes if we get a chinook and there’s a hive that needs checked, we’ll sneak an early peek! The weather is getting warmer and the bees more active, so it’s important to make sure they have enough food to carry them through until they have a natural food source. We feed the bees sugar water and pollen to get them off to a great start! Bees enjoying some delicious pollen! Bottom black frame is full of delicious sugar water. One way to start a new beehive is to get a package of bees. The bees come in a screened box with a queen, so they are ready to go into a hive. Each box contains 2-3 pounds of bees. Packages usually come in at the end of April and are installed as soon as possible. Newly installed package of bees. 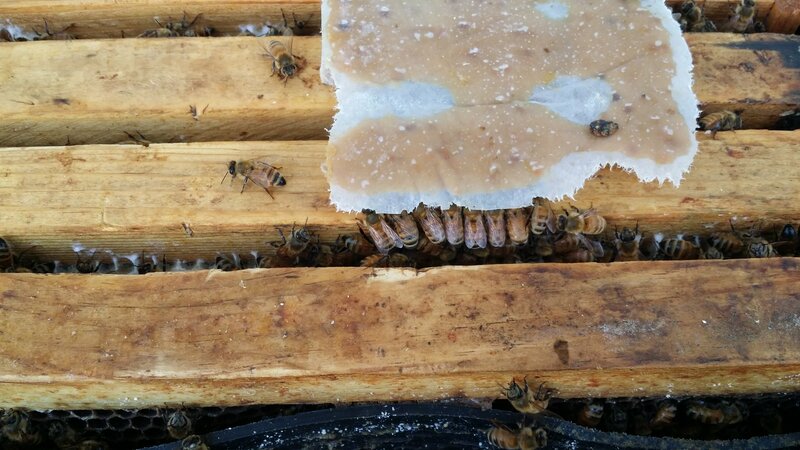 On top of the frames is pollen for protein! As summer progresses, the population in the hive grows. At this time, we keep an eye out for swarms and split hives (two more ways to start a new hive!). 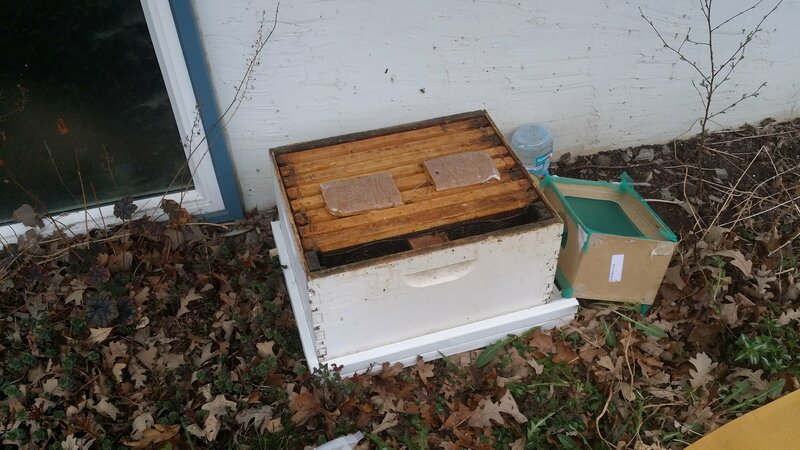 To split a hive, we put a few frames of eggs and brood from the main hive into another box. The bees will hopefully raise a new queen at which time we put them into a new hive. Hive after a split. The small box on the left will hopefully turn into a successful new hive! There are so many bees at the front of the hive too! The hanging cell is called a queen cell. 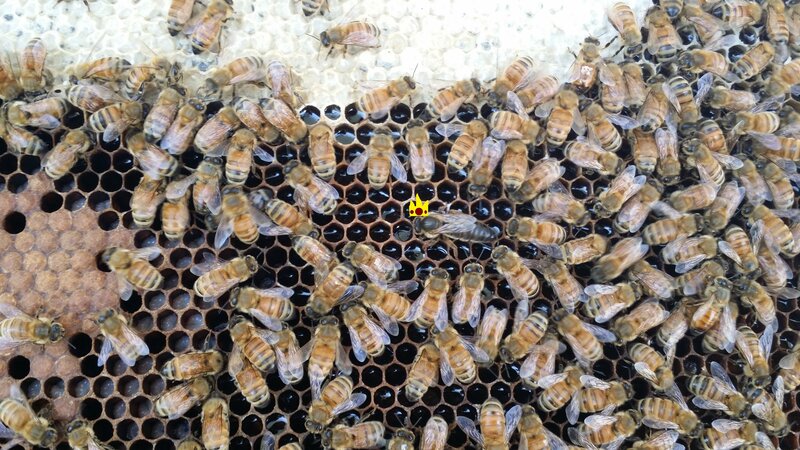 Pretty soon this hive will have a new queen! Sometimes, the bees get too crowded in their hive. This triggers a swarm where the queen takes 1/3-2/3 of the bees out of the hive to find a new home. The bees left behind will raise a new queen and continue on their way. Although swarms may look scary, the bees are busy finding a new home and tend to be quite gentle! Swarm of bees on a tree. This was a tricky one to capture! Show us the honey! This time of year we have the big honey flow. It’s also time to extract the honey. 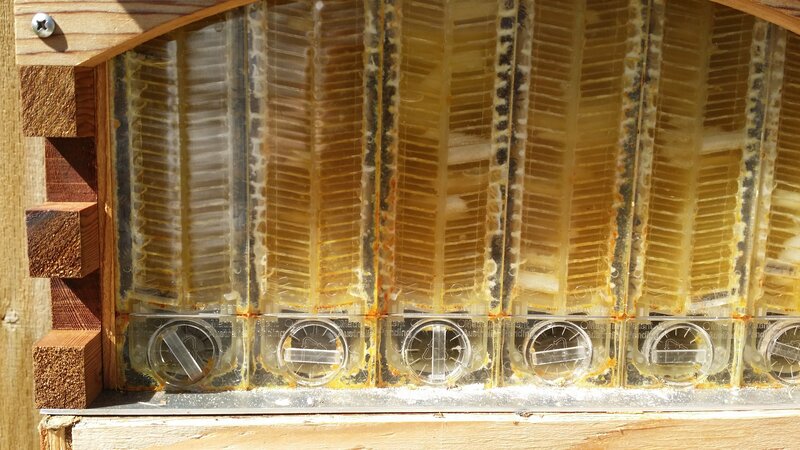 We use the Flow Hive to make extraction super easy! 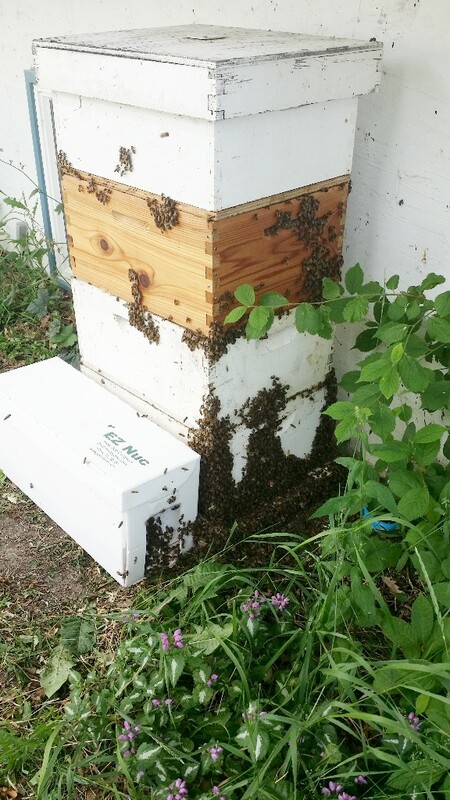 Storing an extractor for use once a year wasn’t feasible for us, so the Flow Hive has worked great! Back view of the Flow Hive. Look at all that delicious honey! First drops of honey from our very first Flow Hive extraction! Well done bees! What a harvest! The last of the flowers are finishing and the weather is getting cooler. This month, we do our final extraction and begin winter preparations. 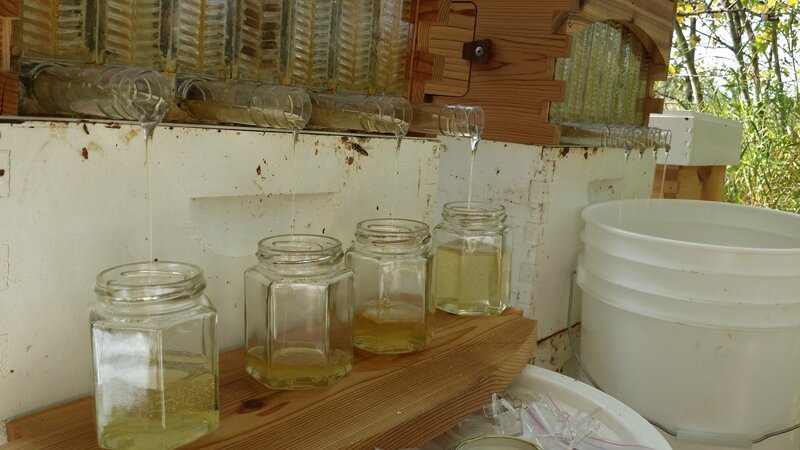 With the decline in flowers, we supplement the bees with sugar water as we did in the spring. It’s extremely important to have strong hives with plenty of stores to get through the long winter months! The hives are all tucked in for the winter and it’s time for a break! Over the winter, we prepare equipment and get ready for a new season of beekeeping. Insulated and ready for winter! Every year is a new adventure and the bees have so much to teach us! Bees and flowers. Can it be more perfect? 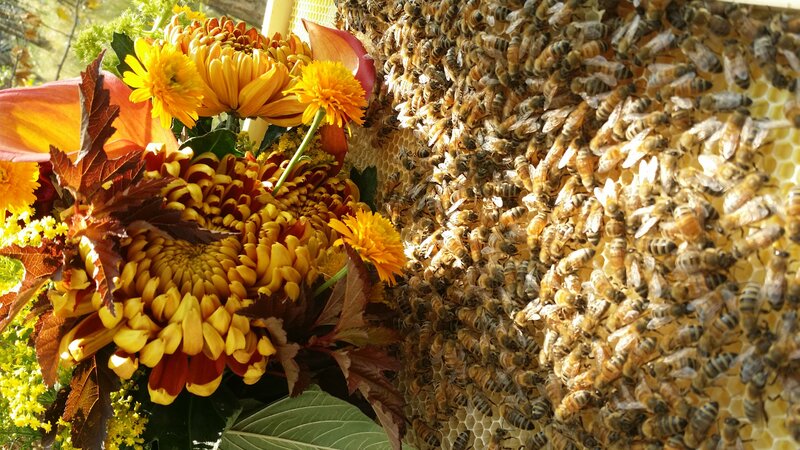 During the beekeeping season, we share pictures on Instagram and the occasional YouTube video. Follow us to get the latest updates! Facts are from 2016 courtesy Agriculture and Agri-Food Canada. Click here to get even more interesting statistics. Are you interested in supporting the bees in your yard? Check out our blog post on supporting native pollinators. The post includes great resources on providing a welcoming environment, understanding the bees, and getting more hands on with a bee house. If you’re interested in having a hive in your yard, let us know by filling out this form. When we are expanding, you may get an email from us! Today we’ll take you through a quick tutorial to make a ~4″ tall beeswax pillar. Have fun! Measure the halfway point on the short side of the beeswax sheet. Make a small mark at the halfway point. Repeat on the other side of your sheet. Lining up the markings you just made, use your ruler to cut a straight line across. Now you should have two pieces. Place the pieces on top of each other to make sure they are the same size. Trim any excess. Measure the wick against the short edge of the wax. The wick should run the full width of the wax plus extra for lighting (minimum 1/4″). Once your wick is cut, roll the wax over the wick. This is the trickiest part! It gets easier from here. Roll the wax tightly while paying attention to the bottom – it should stay flat! At the end of your first piece, slightly overlap the second piece. Continue rolling. When the seam appears on the top of the candle, gently press the pieces together. Keep rolling to the end of the second piece. At the end of the second piece, gently press along the seam to seal the candle. Bravo! You have a beautiful handmade rolled beeswax candle. Looking for supplies? We carry beeswax sheets and wick! Use our handy wick calculator on the wick page to calculate how much you’ll need. Stocking Stuffers. Made Local with Love. We get to meet a TON of amazing makers every market day. We’re sharing the love with you today with a highlight of some local makers to help with your holiday stocking stuffer shopping. Enjoy! Tell someone you’re thinking of them with this adorable You’re My Cup of Tea tin. This tin of loose leaf tea is a wonderful alternative to chocolate and you can choose the tea flavour you think your recipient would like best! These tins are small enough to tuck into a lunch kit, pocket, or purse for a little surprise for that special someone in your life. Each tin contains 3-5 servings of premium loose leaf tea. A consistent best seller! It clips onto any tea bag, so you don’t have to dig it out with your fingers! Perfect to close loose leaf tea bags or for using on tea bags without strings. They make great stocking stuffers, office gifts, teacher gifts or little friendship gifts. They also fit in a bubble envelope and can be mailed as an oversized letter! These little bombs are a perfect addition to an awesome bath. Kids will go gaga over the bright colors and delicious smells! They will make the water a pretty color too! Clean, exfoliate, and slough away dry dead skin with this all natural moisturizing loofah scrub soap bar. Handcrafted with plant-based oils and an invigorating blend of lime, pink grapefruit & fir essential oils. Ignite your imagination and dip into the ocean with this cat mermaid enamel pin. Made of zinc alloy and gold plated with two backers. The clutch backing will keep it safe and attached to your favourite bag, scarf, tee shirt or jacket. Ever need to drop an F-bomb…but your kids are around, are at work, or stuck at a family gathering? Here’s the product for you! Designed as a poly-fil filled stress ball, this crochet F-bomb will definitely start up conversations, relieve some stress, or make a great gift! Have your family photos transferred onto a miniature house that’s hand cut by Sara and made from the reused wood of an old abandoned house somewhere on the Alberta prairie. How it works: Purchase the custom family house ornament listing through Etsy. Then send Sara your family photo(s) either scanned as a digital JPEG or a picture taken with your phone and she’ll do the rest! All ornaments are finished with the loving phrase “you are my home” stamped on the bottom. Size: measures *approximately 2 1/4″ wide x 2 1/2″ tall x 3/4 ” deep. Get rid of the plastic wrap and bags in your kitchen for good! Beeswax food wraps can be used for directly wrapping food or as a cover for your favourite dishes. Our 9″ circle wrap is ideal for wrapping small fruits and vegetables or covering small bowls such as cereal bowls. I LOVE going out to Millarville for the farmers’ market. It’s a beautiful location, the vendors are lovely, and it’s very well organized. Not only that, the shoppers are delightful people too! Each week, it’s a pleasure to catch up with regular vendors. That said, it’s also wonderful to meet new vendors! This often happens during special event weekends. For Fair Weekend, I was fortunate to find myself beside the delightful Clare and Pam from The Cookie Cupboard. Clare and Pam make delicious baked goods, especially the raspberry shortbread. I ate mine long before it crossed my mind to take a picture, so here is a picture courtesy The Cookie Cupboard! For the summer, they also made very clever watermelon crisp rice squares. Watch for their special holiday themed squares coming out later this year! I know I can’t wait to see them! As always, huge thanks to Melonie from Millarville Farmers’ Market for being an amazing market manager, thank you to The Cookie Cupboard for being fantastic booth neighbours, and thanks to everyone who came out for Fair Weekend! We’re back into the swing of market season and we’re so excited about our lineup this summer. We’re at Millarville Farmers’ Market, Stephen Ave, and Calgary Stampede Maker Market to name a few! We were very excited to be part of the inaugural Etsy: Made in Canada Spring market this year. I love meeting new makers and was fortunate to be beside Nastasha of Nastasha Designs. She makes absolutely gorgeous watercolour flowers. They are available as prints (ready to frame or framed) and greeting cards. This market was one of her first markets ever! Before returning to her art, Nastasha did quite a bit of travelling through school and work. I enjoyed her stories throughout the day! When I asked her about her favourite piece, Nastasha picked this lovely pink flower (buy it as a print or a card). Did you know her flower designs are inspired by her daughter? My daughter is the inspiration behind the flowers, she has brought so much love and beauty even if she’s little firecracker full of energy. The abstract flowers are a representation of our life now, blurry from the lack of sleep, time, energy but still incredibly beautiful. It’s nice to come back to my root after spending most of my 20’s traveling and working in the corporate world. What a great inspiration! I had a hard time choosing which design I liked best and ended up buying a mixed package of cards. One can never have too many blank cards on hand just in case! Huge thanks to our lovely organizers for putting on yet another fantastic event (learn more about Jillian and Lindy here)! Thank you to Nastasha for being such a great booth neighbour. Special thanks to everyone who came out to support the local talent. We couldn’t have a successful day without you! 3 Steps to Encourage Local Pollinators to Visit Your Yard and Stay! This article focuses on bees and in particular native bees. However, many of the ideas will also encourage other pollinators. Supporting our honeybees and native bees has become quite the rage over the last few years. Last season, native bee houses were extremely popular. I’ve put together a few tips to encourage pollinators to visit your yard. They will also improve your odds of hosting a successful bee house! Supporting native bee species is a bit different than managing honeybees. Beekeepers can place a managed honeybee hive in a convenient location (with some restrictions). The bees are directly introduced into their new home. Native bees, however, need to be enticed. If you have a bee house, you will want to gently encourage them to inhabit the new home you’ve generously provided for them. The first step in this process is to provide a proper habitat to attract them. Good food and water sources can go a long way in attracting pollinators. In turn, it can increase the probability of a busy bee house! Bees need both nectar and pollen for survival. Pollen, which consists of small grains and carries the male reproductive cells of the plant, provides a source of protein and fats. Nectar is a sugar-rich liquid produced by plants to encourage pollination. Foraging bees use this as a source of energy . Honeybees also turn nectar into honey. Some bee species are specialists relying on a single type of flower to survive while others are generalists. Bumblebees, for example, are generalists. They tend to be attracted most to blue or violet flowers although they will visit other flowers as well . Place your landing pad material in the dish. Fill dish with water leaving the top of your landing pad material exposed. Tip: Since the dish is shallow and we live in a dry climate, keep an eye on the water level to ensure there’s enough water to encourage a steady stream of visitors. Last summer, I refilled mine as often as daily on the hottest days. A cat water dish or shallow dish from a second hand store filled with pebbles both work great! Depending on the species, bees are considered either social or solitary. Honeybees and bumblebees are two commonly encountered species. Both are social bees. Honeybees are a non-native species originating in Europe or Asia. These are the only species of bee that produce honey harvested for commercial purposes. Bumblebees, on the other hand, are a native bee species. They tend to live in underground hives with populations of 150-200 bees . Honeybee hives can reach a population of over 70 000 bees during peak honey flow. In Alberta, we have over 300 native species of bees, most of which are solitary. If you have a native bee house, these are the bees you will be aiming to attract. Solitary bee species tend to be shy and skittish. Low traffic areas will allow the bees to feel safe. Providing shelter can help them avoid predators such as birds. Early morning sun is helpful to give them an earlier start to the day. If you can identify the species you have in your yard, do a bit of research on their preferences to figure out an ideal location for your bee house. I’ve provided some resources below to help you get started. For example, mason bees use mud to seal their eggs in, so having moist soil nearby is a must. Sources of pollen and nectar within 300 feet of the house is also helpful for mason bees as that is their greatest foraging distance . A good location for your bee house if you’d like to attract mason bees could be at the back of a flower bed you don’t weed often. Other good locations may include a fairy garden, on a tree, on a building, or on a post. If the bees aren’t moving in after a season and you have a lot of bees in your yard, try somewhere else! Encouraging pollinators to visit your yard can be an extremely rewarding experience. By implementing the ideas in this article, I’m sure your yard will be buzzing in no time! Good luck! I can’t believe it’s time to start markets already! It feels like winter doesn’t want to end this year. Our first market of the season was the Downtown Valentine Market organized by Delisle Marketing at Gulf Canada Square. Aside from a couple small markets in January in years past, this has been our earliest market to date. We had a fun day providing shoppers with unique gifts just in time for Valentine’s Day. I was fortunate to have a table beside Laula Handmade. Catherine and Nicole make beautiful knit and woven products. When I asked what their current favourites were, Catherine chose their pom pom toques. Nicole’s selection was a gorgeous scarf they displayed on their mannequin all day (except when it was being worn in this picture or tried on!). There were two items that caught my eye on their table – the woven scarves and wooden buttons. How fun would these buttons be on your next crafting project? We had a fun day downtown and I’m looking forward to the next market. Thank you to Laula Handmade for being great booth neighbours. Thanks to Delisle Marketing for putting on the event. Huge thanks to everyone who came out to support us. I am so delighted to share this podcast and blog post with you! Last year, I had the opportunity to chat with Shannon from Earthy Decor. She has put together an amazing blog and podcast on earth friendly lifestyles. In this episode, we had a great time chatting about bees and business. Check out the blog post for the highlights of the podcast along with a few resources I shared. Minimalism, urban farming, aquaponics, tiny living, zero waste, nutrition, environmental health, and sustainability. I also talk to those that live alternative lifestyles (off of the grid, van life, and tree house dwellers. Let’s restore nature, ourselves, and the world around us. Let’s be Earthy (Earth Friendly). I for one love following her blog posts and listening to new episodes of the podcast! I hope you enjoy it too!